Myself Lee Allen, Nidge Smith and Steve Hollis made a great team this year, we had a great time and enjoyed the course and in the end came 2nd Open Male vets team. It was great to catch up with old friends and see them do well, Stuart and John Prentice along with Nick Towers and Dave came second in the male teams of four closely followed in 3rd by Johnty and the Stif Cycles boys, it was great to see the race unfold and one of my favourite moments was having a close race with Nick on one early morning lap. We had some great help too, our race kit from Royal was so comfortable, perfect for racing in, special thanks to Steve Peat for arranging the kit for us. 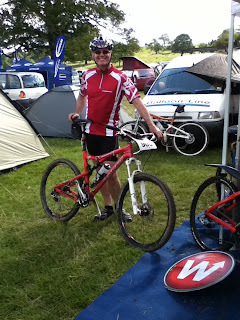 Thanks also to Dickon at Santa Cruz Uk, Stif Cycles and Exposure Lights, we really did put everyone else in the shade. All the team have had a hard year at work and are looking forward to getting our act together next year.